i'm starting this adventure by putting them in the car for brief rabbit reality adjustments. they'll just sit inside while nothing traumatic happens. they'll be outfitted with their favorite treats tunnels and blankets while they're doing this. then after a few times of it not being at all scary...we'll go on little trips. then we'll go on bigger trips. then we'll just drive from new york to oregon, easy peasey. right?! they will have the entire back of my exterra all to themselves and i'll have it flattened out and comfy cozy so that one of us can crawl back there and make sure that bells isn't piercing nuage's back and neck with his claws....which is what he usually does, but i've never had a co pilot before!!! we're also only packing their x pen collection in the camper so as soon as we stop they'll have up to 4000 feet of bunny run around room in any state park that's luck enough to have them! do you think that's enough? i sure do want to thank you ALL for your advice and your stories and so many great ideas!!!!! i also want to thank those of you who helped me so much with your RAW file input. turns out i needed to install the software that came with the camera. duh! i've done all that now, but i still haven't braved trying to download them! i have no room on my hard disc...the story of my life. so i have to move stuff to the external hard drive, then delete and then learn to edit RAW files and then i'll have an empty memory card to take more bunny photos with! how lame am i? that's rhetorical...i know darn well how lame i am, so zip it! 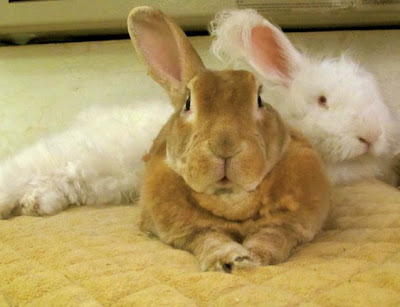 What happened to the bunnies' left ears? BG: regarding their left ears, they're out in oregon already....it's all part of the grand plan! i know you're not supposed to scold a bunny but is it ok to blackmail them? What kind of Memory card does your camera use? Have the buns been hanging out with Amelia di Qi? Has she been teaching them ear disappearing tricks?????? Alas, I can not come to visit. Law school starts in a week!!!!! I just moved to Queens (see current post) but I'll still be around for work, if you pass through. Good luck with everything!